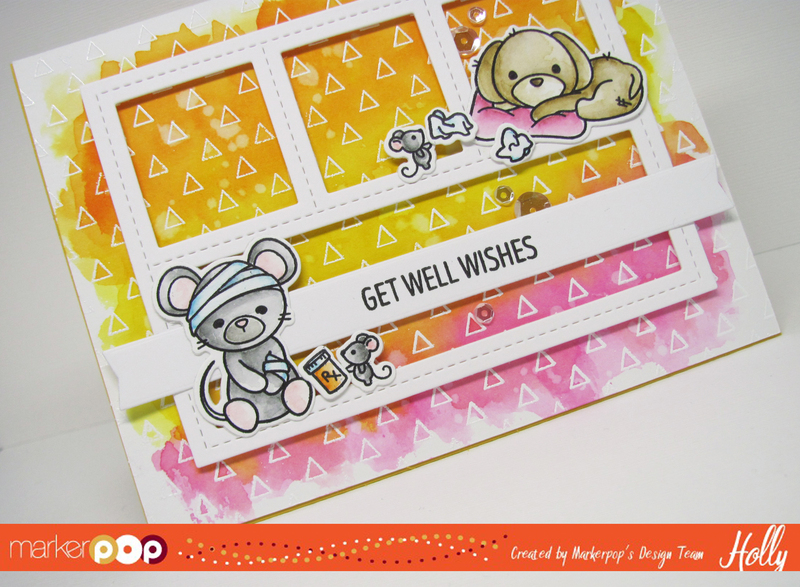 Hollybeary Creations : Get Well Wishes! Happy Monday everyone! I have a fun set of cards using the Super Cute Get Well Gang set from WPlus9. This is a great set to create Get Well cards with. I've created two cards with this set using the same layout but different colors and images. In the video below I create this Yellow and Pink version. I created a Blue version as well and I colored the images with Copics to show how versatile a layout can be. Just change up an image or two or the Color Palette and you have a different card. I started by Stamping the Transparent Triangles Background stamp from My Favorite Things onto a piece of Tim Holtz Watercolor card stock and heat embossed the image in White. Then I added Distress inks in Mustard Seed, Picked Raspberry & with a Large Paintbrush. I flicked some water onto the background and lifted the color with water for a more distressed look. Then I adhered the panel to a Yellow A2 size card base. I die cut the frame from the Blueprints 27 from My Favorite Things using a piece of Neenah Solar White card stock. I adhered the frame with some Foam Tape. Then I stamped the images onto another piece of the same watercolor card stock using VersaFine Black Onyx ink. Then I watercolor the images using Distress Markers and a paintbrush. I die cut the images using the coordinating dies and the Big Shot and set them aside. I stamped the sentiment onto a piece of Neenah Solar White and cut it out using the Banner from the Blueprints 27 set. I adhered the banner and all the images with some Foam tape and Liquid glue. For an additional pop of Shimmer I added some Pretty Pink Posh Mixed Sparkling Clear Sequins. I created the second card below in the same way just changing up the images and I colored the images in with Copics. I used the following Distress Makers for the images: Hickory Smoke, Pumice Stone, Tumbled Glass, Spun Sugar, Carved Pumpkin, Picked Raspberry, Brushed Corduroy, Gathered Twigs & Antique Linen. Check out the video below for more details on how I created this card.